This is my very first poke cake. I can't believe that I've never tried this classic cake. It was so easy to make. It started with a simple box cake mix a some jell-o. The only change I made to the original recipe was to make my own buttercream frosting. Don't skip the homemade chocolate buttercream - it is to die for! The cake was great and very festive! Chicken Legs sampled a few pieces and I took it the rest of the cake to work. There were no leftovers! Prepare and bake the cake according to package directions, using a 9X13 baking pan. In small bowl, dissolve gelatin in boiling water and then stir in cold water. With a meat fork or wooden skewer, poke holes in cake about 2 inches apart in all directions. Slowly pour gelatin over cake. Refrigerate 2-3 hours. For frosting, in a small mixing bowl cream butter until fluffy. Beat in confectioners sugar, cocoa, whipping cream and vanilla until smooth. Add any additional whipping cream until the buttercream is the desired consistency. Spread over cake. 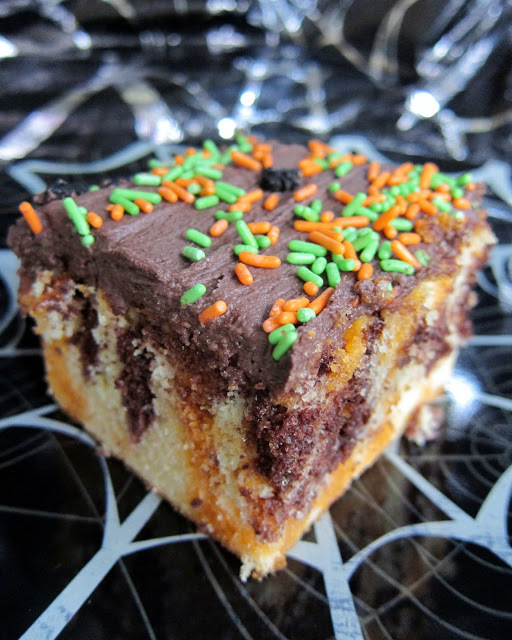 Top with Halloween sprinkles and/or candy corn. Yum!!! Going to Pin you now!! 495 people stopped by to see the biscuit post. Making them again today! I donts no nuthin' 'bout no poke CAKE, but I do luvs me some POKE SALAD ! oh yeaz, I lovs me some poke sammiches too. Anybody here wanna get poked ? I've made a couple of variations and they have all been good. What a brilliant poke cake!!! Can't wait to try this! Just wondering... Is the jello consistency different that it needs to be poked with the meat fork/skewer or would the back of a wooden spoon work like I use for pudding poke cakes. Corinne - The back of a wooden spoons would be fine. Enjoy! This may be a stupid question lol but does the cake have the jello in it? or does the cake absorb the jello to make it more moist?